The course offered by City was my primary consideration when applying. International Political Economy offers me the possibility to study International Politics, International Relations and Macroeconomics. The international student body, its multicultural social life and the central location also attracted me and prompted me to apply for City as I have always wanted to study in an international environment. 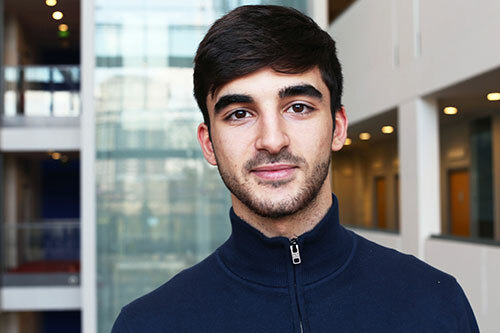 My favourite thing about studying at City is surely its commitment to diversity and multicultural integrity, which enabled me to adapt to a new international environment and get in touch with new cultures. Moreover, the prestige of the Department of International Politics, its ongoing seminars about current events and the experienced lectures have surely helped my studies. Alongside the academic experience, what I also love about City is its variety of extracurricular activities, clubs, societies and volunteering activities which offer opportunities to develop your skills. Being able to continue playing basketball for the basketball team of City was certainly a determinant factor for my experience and helped me meet new friends. I was recently awarded a place in the Professional Mentoring Programme which enables me to develop my career opportunities and get a mentor from the industry I would like to apply to after my graduation. I am also part of the City Politics Society. After my graduation, I plan to continue my studies and pursue a master's degree. After graduation, I plan to work for an international governmental or non-governmental organization. Be determined, focused, and always flexible to adapt to new situations and environment. Be able to get the best from your experience at City by linking academic studies with extracurricular activities to develop and perform new skills. Take every opportunity you may be offered and get the best from them. Be dedicated, committed and passionate about what you do.